The Ganges-Brahmaputra-Meghna (GBM) river system is considered to be one large trans-boundary river basin, although the three rivers of this system have distinct characteristics and flow through different geographical regions. A semi-distributed model that can account for the spatial variability across the catchment is used to determine the magnitude and variability in flows, sediments, and nutrients of the GBM rivers in response to changes in precipitation, essential inputs for delta analysis. The model captures the main dynamics of the rise to the peaks in monsoon periods from May to November and the recession curves towards the dry season. 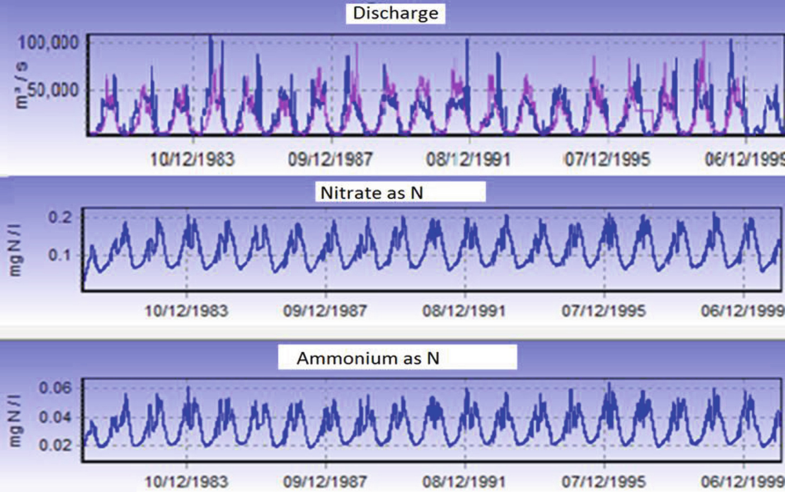 Comparison of simulated and observed nitrogen loads in the Ganga River suggest that the model is also simulating realistic nutrient fluxes. The large river systems of the Ganges, Brahmaputra, and Meghna (GBM) combine to create the GBM delta. Over 670 million people depend on the river basins and the associated delta for their livelihood and well-being. 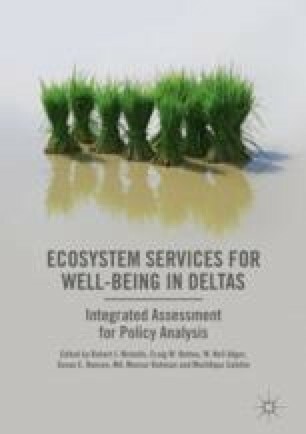 Thus, knowing how such river systems might be impacted by future changes in climate and socio-economics is important for the wide range of stakeholders in the delta region. This chapter summarises the physical aspects of the GBM system and describes the modelling of the catchments for flow and water quality. The GBM river system extends between the latitude of 22° 30′ N to 31° 30′ N and longitude of 78°0′ E to 92° 0′ E in the countries of India, Nepal, China, Bhutan, and Bangladesh (Fig. 13.1), with a total catchment area of 1,612,000 km2. The GBM river system is considered to be one large trans-boundary river basin, even though the three rivers of this system have distinct characteristics and flow through very different geographical regions for most of their lengths. They join to form the GBM delta before flowing into the Bay of Bengal. The GBM river system is the third largest freshwater outlet to the world’s oceans, being exceeded only by the Amazon and the Congo river systems. The headwaters of both the Ganges and the Brahmaputra Rivers originate in the Himalayan mountain range. The Ganges River originates from the Gangotri glacier in the Himalayas at an elevation of nearly 7,010 m and traverses a length of about 2,550 km (measured along the Bhagirathi and the Hooghly) before it flows south-east into the Bay of Bengal. Along its way, the Ganges is joined by a number of tributaries to form the large fertile alluvial plain in North India. At the Farakka barrage, a major diversion delivers water from the Ganges into the Hooghly River providing water to West Bengal and Kolkata. Approximately 50 per cent of flows are diverted except during high flows (>70,000 m3/s), with the exact diversions varying depending on inflows and season. The Farakka Treaty signed between India and Bangladesh in 1996 was a significant agreement between the two countries and provides an agreed mechanism for sharing the available water (Farakka Treaty 1996). After the Farakka Barrage, the Ganges, Brahmaputra, and Meghna Rivers join and flow into the Bay of Bengal. The main sources of water in the rivers are rainfall, subsurface flow, and snow-melt water from the Himalayas. Average annual rainfall varies between 300 and 2,000 mm, with the western side of the region receiving less rainfall in comparison with the eastern side. Rainfall is concentrated in the monsoon months of June through October, causing low flow conditions in the Ganges River and its tributaries during the dry periods of November to May. Fertile Eutric Cambisols are the main soil type in the lower basin, ideally suited for intensive cultivation. Shallow Luvisols of low fertility dominate the upper basin of the Ganges River. Land use in the India part of the Ganges basin consists of extensive agricultural land with a wide variety of crops, expanding urban areas, and areas of scrub and bare soils. The upper reaches consist of snow and rock, some remaining forest, and urban areas. The major cities located in the river basin are Delhi, Kolkata, Kanpur, Lucknow, Patna, Agra, Meerut, Varanasi, and Allahabad. These cities are expanding at a substantial rate as reflected in the rising population levels and extensive industrial growth. According to census data, the average population density in the Ganges basin is of the order of 520 persons per km2. Electronics, leather, textiles, paper, jute, cement, and fertiliser production are some of the industries situated along the course of the river. Disposal of untreated urban wastes and industrial effluents increase pollution loads into the Ganges river system. According to the Central Pollution Control Board Report (CPCB 2003), the total wastewater generation from 222 towns in the Ganges basin is 8,250 ML/d (million litres/day), out of which 2,538 ML/d is directly discharged into the Ganges River, 4491 ML/d is disposed of into tributaries of River Ganges, and 1,220 ML/d is disposed onto land or low-lying areas. The Ganges river system is a very large and complex river system to model and becomes even more complex once it enters the Bangladesh delta region with a complex network of channels and braided river systems. This area is a tidal zone and is included as part of the estuarine modelling component of this research (see Chap. 16). The Brahmaputra river originates on the northern slope of the Himalayas in China, where it is called Yalung Zangbo. It flows eastwards for about 1,130 km, then turns southwards, and enters Arunachal Pradesh (India) at its northernmost point and flows for about 480 km. Then it turns westwards and flows through Arunachal Pradesh, Assam, and Meghalaya for another 650 km before entering Bangladesh, where it is also called Jamuna, and merging with the Ganges and Meghna rivers. The tributaries of the Meghna river originate in the mountains of eastern India and flow south-west to join the Ganges and Brahmaputra rivers before flowing into the Bay of Bengal forming the greatest deltaic plain in the world. About 80 per cent of Bangladesh is made up of fertile alluvial lowland that becomes part of the Greater Bengal Plain. The country is flat with some hills in the northeast and south-east. About seven per cent of the total area of Bangladesh is covered with rivers and inland water bodies, and the surrounding areas are routinely flooded during the monsoon. The GBM river basin is unique in the world in terms of diversified climate. For example, the Ganges river basin is characterised by significant snowfall and precipitation in the northwest of its upper region and very high precipitation in the areas downstream in Bangladesh near the delta. High precipitation zones and dry rain shadow areas are located in the Brahmaputra river basin, whereas the world’s highest precipitation area is situated in the Meghna river basin. Monsoon precipitation in the Ganges river basin lasts from July to October with only a small amount of rainfall occurring in December and January. The delta region experiences strong cyclonic storms, both before the commencement of the monsoon season, from March to May, and at the end of the monsoon from September to October. Some of these storms result in significant loss of life and the destruction of homes, crops, and livestock, most recently in Cyclone Sidr in 2007. The main objectives of this research with regard to upstream catchments have been to assess the magnitude and variability in the flow of the GBM rivers as a function of future changes in the climate, land use, and socio-economic conditions and to determine the flux of flows, sediments, and nutrient fluxes moving down the rivers into the Bay of Bengal, essential inputs for any analysis of the delta. Flow, sediment, and nutrient fluxes can provide critical information that can assist the Indian and Bangladesh governments to mitigate future impacts. There are several existing modelling studies on the Ganges river, most of which were funded by either government departments or international organisations, such as the World Bank (Sadoff et al. 2013). In order to undertake an assessment of the hydrology and nutrient dynamics in the GBM rivers, the semi-distributed, process-based INCA model (INtegrated Catchment model) for nitrates (N) and phosphates (P) is applied to the whole of the GBM river systems (Whitehead et al. 2015a, b). A set of climate and strategic socio-economic scenarios have then been evaluated to assess the potential impacts on both flows and water quality in the GBM river system. Modelling complex river systems such as Ganges, Brahmaputra, and Meghna requires a semi-distributed model that can account for the spatial variability across the catchment. INCA is one such model that has been applied extensively to heterogeneous catchments and has the advantage that it is dynamic, process-based, and integrates hydrology and water quality. The INCA model has been developed over 20 years as part of the UK Research Council (NERC) and EU-funded projects (Whitehead et al. 2015b), and the model simulates hydrology flow pathways in the surface and groundwater systems and tracks fluxes of solutes/pollutants on a daily time step in both terrestrial and aquatic portions of catchments. The model allows the user to specify the spatial nature of a river basin or catchment, to alter reach lengths, rate coefficients, land use, velocity-flow relationships and to vary input pollutant deposition loads from point sources, diffuse land sources, and diffuse atmospheric sources. INCA originally allowed simulation of a single stem of a river in a semi-distributed manner, with tributaries treated as aggregated inputs. The revised version now simulates nutrient dynamics in dendritic stream networks as in the case of the GBM system with many tributaries. The model is based on a series of interconnected differential equations that are solved using numerical integration based on the fourth-order Runge-Kutta technique. The advantage of this technique is that it allows all equations to be solved simultaneously. The INCA model has been set up for the rivers as a multi-reach model with all the sub-catchments and reach boundaries being selected based on a number of factors such as a confluence point with a tributary, a sampling or monitoring point, or an effluent input or an abstraction point associated with a major irrigation scheme or a large city. 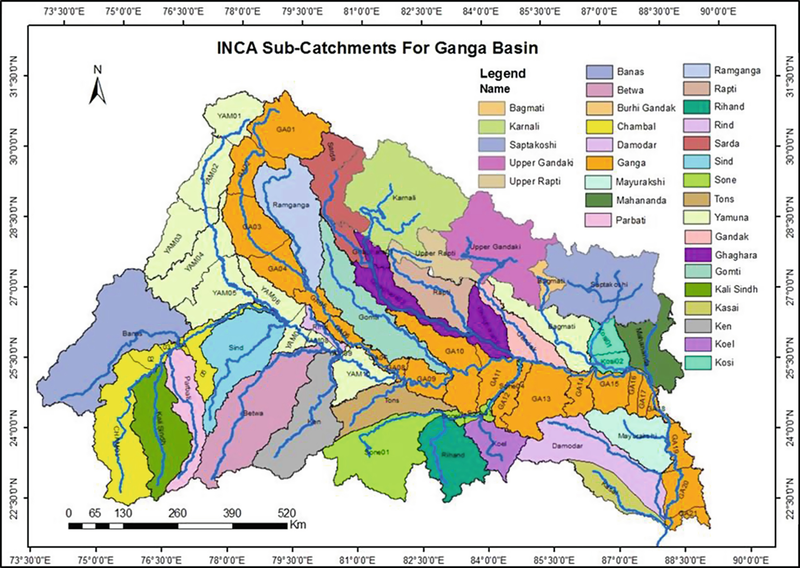 Figure 13.2 shows the sub-catchments for the Ganges. The land use data have been derived using a 1 km grid resolution DTM with land cover data generated from the moderate resolution imaging spectroradiometer (MODIS) satellite. Further details of the model setup are given in Futter et al. (2015), Jin et al. (2015), and Whitehead et al. (2015a). In order to run a set of hydrological simulations and climate scenarios, INCA requires a daily time series of climate data, namely, precipitation, hydrologically effective rainfall (HER), temperature, and soil moisture deficit (SMD). The model uses these data to drive the hydrological components of the model which generate the sub-catchment river flows. However, obtaining meteorological data over such a large catchment scale is difficult, especially given the wide spatial differences in topography, altitude, and land use in India, China, Bangladesh, Bhutan, and Nepal. Observational data are available from in-situ weather stations and also from satellite measurements, and these have been integrated into observational datasets which cover the region as part of the Aphrodite online data system.1 These data have been used to calibrate the climate models both in space and time. The large-scale general circulation models (GCMs) have been used to simulate climate across the region and to assess the impacts of increasing greenhouse gas concentrations on the global climate system. However, GCMs typically have coarse spatial resolutions with horizontal grid boxes of a few hundred kilometres size and cannot provide the high-resolution climate information that is required for climate impact and adaptation studies. The use of regional climate models (RCMs), which dynamically downscale the GCM simulations through being driven using boundary conditions from GCMs, can provide higher resolution grids (typically 50 km or finer) and are better able to represent features such as local topography and coast lines and their effects on the regional climate, in particular precipitation. There have been relatively few studies focused upon the Ganges river linked to the Bangladesh region which have used RCM output. In this research, an existing set of GCM simulations were used to provide boundary conditions for a RCM for the period 1971–2099 over a South Asia domain, as described in Chap. 11 and Caesar et al. (2015). The GCM is the third climate configuration of the Met Office Unified Model (HadCM3) and is run as a 17-member perturbed physics ensemble driven by the IPCC’s Special Report on Emissions Scenarios (SRES) A1B scenario (Nakićenović et al. 2000). SRES A1B was developed for the IPCC and still underpins much recent research into climate impacts. It is a medium-high emissions scenario and is based upon a future assumption of strong economic growth and associated increase in the rate of greenhouse gas emissions. To put this into context with the newer Representative Concentration Pathways (RCPs) used in the IPCC Fifth Assessment Report, SRES A1B lies between the RCP 6.0 and RCP 8.5 in terms of the end of twenty-first-century projected temperature increases and atmospheric carbon dioxide concentrations (see Chap. 11). The model uses the HER, SMD, and temperature daily time series together with all the reach, land use, and catchment data to simulate flow and water quality at every reach along the whole system for the whole period of 1981–2000. The model outputs are then compared to the observed flow data for the rivers to calibrate and validate the model. The observed flow quality data is sparse on the GBM river systems, although there are several flow gauges on the Ganges and there is a flow gauge on the Brahmaputra at Bahadurabad. In general, the calibration period of 1981–1990 and the validation period of 1991–2000 are both modelled with a good statistical agreement between simulated and observed flow. The Nash-Sutcliffe statistics for the whole period of the observed flow data for the 1981–2000 ranges is 0.55 to 0.75 which, given the complexity of the Ganges and the Brahmaputra, is reasonable. The model captures the main dynamics of the rise to the peaks in monsoon periods and the recession curves towards the dry season, as illustrated for the Brahmaputra in Fig. 13.3. The fits to the Ganges flow data are of a similar order of magnitude (Whitehead et al. 2015a). In addition to calibrating the flow model, it is necessary to calibrate the water quality model. The water quality data is limited to infrequent observations at several monitoring points along the rivers, and Fig. 13.3 shows the simulated daily concentrations of nitrate-N and ammonium-N from the model at the lower reach of the Brahmaputra River System. The observed data for water quality along the rivers is available from the Indian Central Pollution Control Board.2 The mean nitrate (as N) in the Brahmaputra at Dhubri is 0.12 mg/l and comparable to 0.11 from the model simulation. A key objective of the river modelling is to estimate the nutrient load flowing down the river into the Bay of Bengal, as the nutrients are crucial for agriculture, fisheries, and ecology (see Chaps. 24, 25, and 26). These are of primary concern within the project, as they relate directly to human well-being and resource availability for people in the delta region. Figure 13.4 shows the simulated and observed nitrogen load in the Ganges which suggested that the model is simulating the nutrient fluxes well. Finally, Fig. 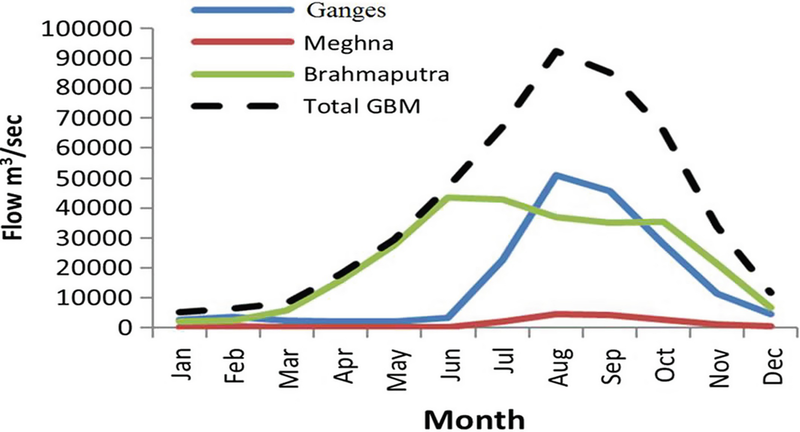 13.5 shows how the flows of the GBM Rivers combine to generate the total flows entering the Bay of Bengal illustrating the build-up of flows in the monsoon season from May to November. The INCA models have been used to evaluate a set of scenarios for flows and water quality, and these are described in detail in Whitehead et al. (2015a, b) and Jin et al. (2015). These scenarios have been used in the models of the study area in coastal Bangladesh (Chaps. 16 and 17) and the Bay of Bengal (Chap. 14), as well as the integrated assessment described in Chap. 28. The INCA model simulated daily flow and water quality for three time slices 1980–2000, 2040–2060, and 2080–2100 using the UK Met Office Hadley Centre model climate simulations. For the 2050s and the 2090s, these results indicate a significant increase in monsoon flows with enhanced flood potential. Dry season flows are predicted to fall with extended drought periods, which could have impacts on water and sediment supply, irrigated agriculture, and saline intrusion. In contrast, the socio-economic changes had relatively little impact on flows, except under the low flow regimes where increased irrigation and dam diversion could further reduce water availability. However, should large-scale water transfers upstream of Bangladesh be constructed, these have the potential to reduce flows and divert water away from the delta region depending on the volume and timing of the transfers. This could have significant implications for the delta in terms of saline intrusion, water supply, agriculture, and maintaining crucial ecosystems such as the Sundarbans mangrove forest, with serious implications for people’s livelihoods in the area. The socio-economic scenarios have a significant impact on water quality, altering nutrient fluxes being transported into the delta region. More details of these results can be found in Whitehead et al. (2015a, b) and Jin et al. (2015). CPCB. 2003. Status of sewage treatment plants in Ganga Basin. Delhi: Central Pollution Control Board, Ministry of Environment and Forests, Government of India. www.cpcb.nic.in/newitems/8.pdf. Accessed 24 June 2016.